In a joint nomination, the Chairs of the Foreign Affairs Committees of the respective Parliaments of Lithuania, Latvia and Estonia have nominated the journalism collective Bellingcat for Pulitzer Prize in Journalism in investigative reporting. As the nomination letter states, with regard to this award, Bellingcat has contributed to the emergence of a new type of journalism. It is a platform to bring together critically acclaimed and emerging citizen investigative journalists using open source information to investigate, collaborate and report worldwide issues that are being underreported and ignored. Furthermore, although most investigative journalism is shrouded in mystery, the platform shows their workings, detailing how they found out the story and which techniques they used. This is not only encouragement to the members of the public to get involved but also signifies a new level of transparency in the reporting on critical issues. As the nomination letter states, as an organization, Bellingcat is responsible for working on, and responsible for breaking, some of the biggest news stories worldwide. The contributions to uncovering the truth made by Bellingcat are unparalleled. They have a proven track record of excellence in investigative journalism. Recognizing the contributions to the creation of this new type of journalism and their investigative work would be long overdue. Bellingcat is a website founded by the British journalist and former blogger Eliot Higgins, where the findings of journalist investigations into war zones, human rights abuses and the criminal underworld are published. It received international attention with its articles on the Syrian Civil War, War in Donbass and the downing of the Malaysian passenger flight in Ukraine. The Pulitzer Prize is awarded by the Pulitzer Prize Board at Columbia University in New York. 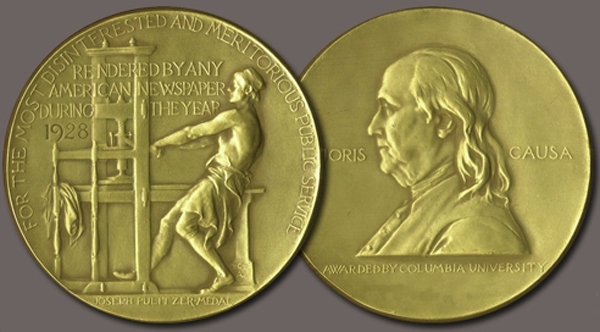 The prize was established in 1917 by provisions in the will of Joseph Pulitzer.